Word Soup is an iPhone game developed by Fuzzy Bug Interactive. 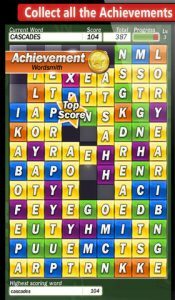 Described by its creators as “a word creation game with a tactical twist,” Word Soup challenges users to make high scores based on a complex point scoring system. 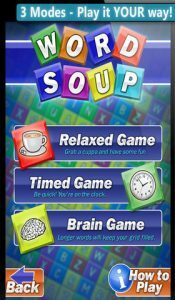 Unlike many other word games where the point value for your word is based solely on length, Word Soup throws a bit of strategy into the mix. In Word Soup, each colored tile with a letter on it has its own point value. Yellow tiles are 1 point, blue tiles are two points, green tiles are three points, orange tiles are four, purples are five, pink tiles are worth eight, and red tiles are worth ten points each. You also get higher scores for longer words. There’s another tricky element as well: in Word Soup, you slide tiles along the topmost row by tilting your phone, adding another level of difficulty to the game. All the while, you are being spurred on by some tension-building calypso music. There are three game modes: relaxed, timed, and “brain game.” The first two are fairly self-explanatory (and thankfully, relaxed mode features relaxing music.) 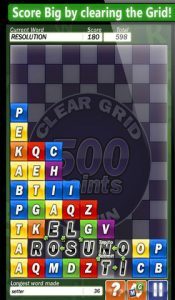 The “brain game” challenges players to use very long words to keep the grid filled. 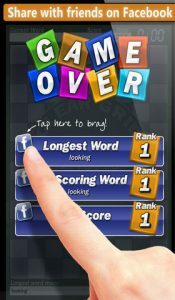 Local highscore tables track Longest Words, Best Words, Highest Scores and more. Word Soup also features Game Center Leaderboards & Achievements. Despite a bit of a laggy load time when you first start up the app, Word Soup quickly becomes a fast-paced word game that’s lots of fun. 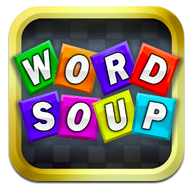 If you’re tired of the word games you already own, definitely give Word Soup a try: it’s a fresh take on a static genre. Word Soupis compatible with iPhone 3GS, iPhone 4, iPhone 4S, iPhone 5, iPod touch (3rd generation), iPod touch (4th generation), iPod touch (5th generation) and iPad. Requires iOS 4.3 or later. This app is optimized for iPhone 5.